This article is for global and SharePoint admins in Office 365 who want to control user access to SharePoint and OneDrive data on unmanaged devices. 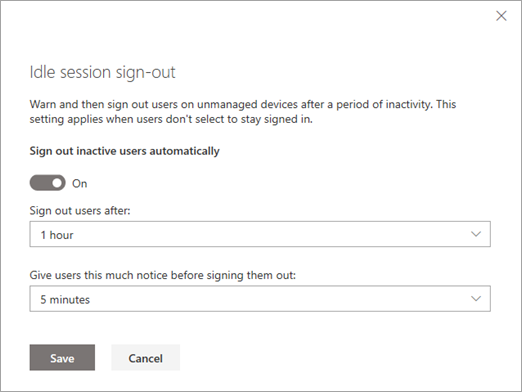 Idle session sign-out lets you specify a time at which users are warned and subsequently signed out of Office 365 after a period of browser inactivity in SharePoint and OneDrive. Idle session sign-out applies to the entire organization and can't be set for specific sites or users. Idle session sign-out is one of a number of policies you can use with SharePoint and OneDrive to balance security and user productivity and help keep your data safe regardless where users access the data, what device they're working on, and how secure their network connection is. For more ways to control access in SharePoint and OneDrive, see How SharePoint Online and OneDrive safeguard your data in the cloud. Activity is counted as requests sent to SharePoint Online, such as clicks. Moving the mouse and scrolling are not counted as activity. If a user is active in another Office 365 service (such as Outlook), but inactive in SharePoint and OneDrive, they'll be signed out across Office 365. If a user has multiple tabs to OneDrive and SharePoint sites open at the same time, they won't be signed out unless they are inactive on all the sites. > Users won't be signed out if they selected to stay signed in when they signed in. 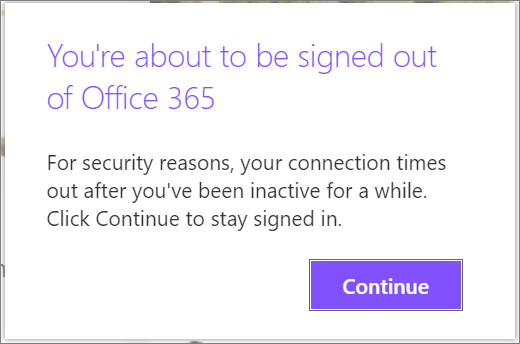 For info about hiding this option, see Add company branding to your sign-in page in Azure AD. Users won't be signed out on a managed device (one that is compliant or joined to a domain), unless they're using inPrivate mode or a browser other than Edge or Internet Explorer. If they use Google Chrome, you need to use an extension to pass the device state claim. For more info about device state claims, see Azure AD conditional access settings. If the classic SharePoint admin center appears, click Try it now to open the new SharePoint admin center. In the left pane of the new SharePoint admin center, under Policies, select Access control. Turn on Sign out inactive users automatically, and then select when you want to sign out users and how much notice you want to give them before signing them out. -Enabled specifies whether idle session sign-out is enabled or disabled by using $true or $false. -WarnAfter specifies the amount of after which a user is notified that they will be signed out after a period of inactivity as a New-TimeSpan which can be configured in seconds, minutes, or hours. -SignOutAfter specifies the amount of time after which is a user is signed out of Office 365 if they do not respond to the -WarnAfter prompt. You must specify values for both WarnAfter and SignOutAfter. The SignOutAfter must be greater than the WarnAfter value. It takes about 15 minutes for the policy to take effect across your organization. The policy doesn't affect existing sessions. To view the idle session sign-out values you've set, use the Get-SPOBrowserIdleSignOut cmdlet. For info about Office 365 session lengths (regardless of activity), see Session timeouts for Office 365.